A graduate of the Rhode Island School Of Design, where his classmates included David Byrne and other members of Talking Heads, director Gus Van Sant has managed an unpredictable and idiosyncratic career, deftly weaving in and out of mainstream and independent circles. After his micro-budgeted 1985 debut feature Mala Noche won critical attention, his career took off with 1989's Drugstore Cowboy, a gritty crime tale that established a warm kinship with outsiders which runs through much of his work. Van Sant's momentum continued through his adventurous follow-up, 1991's My Own Private Idaho, but he hit a roadblock two years later with another ambitious road movie, a misbegotten adaptation of Tom Robbins' novel Even Cowgirls Get The Blues. From there, he made a successful leap into major studio projects, first with his cutting 1995 satire To Die For, and later with 1997's Good Will Hunting, which brought its co-screenwriters/stars Matt Damon and Ben Affleck instant fame and earned Van Sant his only Oscar nomination as a director. In 1998, his penchant for interesting disasters led him to do a scene-by-scene facsimile of Alfred Hitchcock's Psycho, a postmodern experiment that was roundly drubbed by critics. Perhaps as penance, he returned to Good Will Hunting territory again with 2000's uplifting coming-of-age drama Finding Forrester. Along the way, Van Sant dabbled in four-track home recording, producing two quirky albums—Gus Van Sant and 18 Songs About Golf—and wrote the 1997 experimental novel Pink, a thinly veiled tribute to the late River Phoenix. Breaking sharply from the mainstream, Van Sant's daring new film Gerry has polarized critics and audiences with its slow, minimalist treatment of two guys (Matt Damon and Casey Affleck) who get lost on a desert hike. The director recently spoke to The Onion A.V. Club about shooting in Death Valley, the state of American independent film, and the prospect of a punk-rock version of Psycho. The Onion: What happened in the period between Finding Forrester and Gerry that inspired you to make such a radical departure? 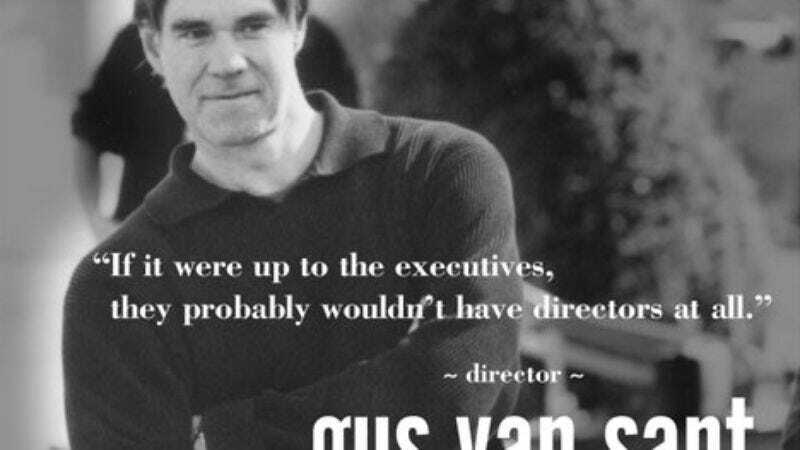 Gus Van Sant: I had been trying to get small projects going all along, but I guess my agents did a very good job of scaring me away from them. Right after Finding Forrester, my main agent left William Morris, so I was loose and able to do something else. It sounds odd, I know, but I think that's ultimately the truth. A lot of times, I relied on connections through my agency, just for financing and things like that. Even when I'm looking for a million and a half dollars to do a small film like Gerry, there can always be hold-ups, because it's a large amount of money for some people, and it's a small amount of money for other people. In any case, it's significant enough to where you have to jump through a lot of hoops to get it to happen. Sometimes, the people who are helping you can drop the ball. And, of course, the reason agents want you to do bigger projects is that they make a bigger cut. Before I did Finding Forrester, someone had gotten me a million dollars guaranteed from a German company to do a small film that had no identity. It was just a film that I was going to direct, and it didn't need to have stars in it. Because I had that guarantee, when Matt, Casey, and I were talking about something we wanted to do together, I already had this money in the bank, so that started the process. O: Stylistically, Gerry is a huge break from what you had been doing. How did that develop? GVS: About two or three summers ago in New York, I saw a six-hour Béla Tarr movie called Satantango. And even though I'd seen these long takes in films by [Andrei] Tarkovsky, or Chantal Akerman's Jeanne Dielmen, watching Béla's film meshed with certain ideas that were in my head, but that I had never expressed in that style before. But making Gerry in that style wasn't the idea at first. Because I had this small amount of money, I was going to go into the desert with Matt and Casey, and I was going to operate the camera, and it was going to be on digital video. It would have resembled Blair Witch or something like that. [Laughs.] I assumed that we were doing a John Cassavetes film in the desert. And because we were shooting on DV, I imagined that it was going to look a little rougher, and we'd sort of discover the style along the way. But Casey persuaded me to shoot in 35mm, and once we did that, everything changed, and we were no longer making the film I originally thought we were making. Along with that came other ideas when we were writing it together and committing to certain ways of shooting it. Everything started to roll in a certain direction. Those two films, Satantango and Jeanne Dielmen, were informing a way to deal with the story we were working out. O: What would the DV version have been like? GVS: Since the film was so up in the air, I thought we were going to have really long periods of ad-libbing dialogue. It would have looked like A Woman Under The Influence, but in the desert. But I was never really holding myself to the Cassavetes model. That was just informing me as I started thinking about the project. I guess Cassavetes came to mind because we didn't have a script. Even though he apparently always had a script, it always looked like he didn't when you saw his movies. But the concept evolved, the more we thought about what was going on with the characters. We actually did a lot of the writing in the desert, and once you're standing in the desert, your behavior changes radically. O: What was it like premièring the film in front of an audience? GVS: We had two or three screenings for friends in New York, where we were editing it. I had a group of advisor friends who I knew would tell me what they thought, and we also had people who were somewhat difficult and had strong opinions. The film played very well for all of them, and, knowing who they are and knowing how opinioned they are—and also assuming they weren't holding anything back—I felt fine with what we had done. But outside of maybe 50 people, we hadn't shown it to anyone until it premièred at Sundance in front of something like 1,000 people. When the film came on the screen, I was really nervous, thinking, "Oh my God, what have we done?" [Laughs.] But I thought the screening went very well, overall. I was sitting in the back and only counted about eight walkouts, so that's a pretty good ratio out of 1,000. O: What do you make of the response to the film in general? O: Did you expect the film to be so polarizing when you put it together? GVS: No, we were just trying to make a movie. We weren't thinking to ourselves, "Ah, this is going to really get 'em," or anything like that. O: Films like Gerry are not uncommon on the international scene, but it's unusual for an American independent film. Do people have expectations for American narratives that make it difficult for them to absorb a film like Gerry? O: Was the film shot sequentially? GVS: Yes. We had to do it that way, because we weren't precisely sure where the film would end up. We could have added things as we went along. You never know, they could have found a road halfway through. [Laughs.] And I encouraged that kind of improvisation. We always wanted the option to change things on the spot. I just finished another film called Elephant that we did the same way. O: What's that film about? GVS: It's about high-school violence. It's done in sequence, but it has more characters, and it's not as austere as Gerry is. But some of the rules were the same: We didn't have a screenplay, we shot in sequence, and we didn't cover shots from different angles. We only had single shots. O: Is it an unknown cast? GVS: They're all just local kids from the Portland area, except a couple of recognizable actors—Matt Malloy plays a teacher and Timothy Bottoms plays a father. O: Was it difficult to coax good performances out of unseasoned kids? GVS: We found them through a rigorous casting procedure, and when there was somebody we liked, we worked with them on improv and decided who could handle it. It was pretty easy, actually. The kids are young enough to where they're used to pretending. When you get older, you tend to get away from that a bit. O: Do you see Gerry and Elephant as the beginning of a different phase in your career, or are you going to continue with studio projects, as well? GVS: I still read the studio screenplays, but I definitely would like to continue shooting the way I've been shooting lately. I'd like to do a studio project like that, which I don't think they'd have a problem with. I could probably talk them into it. But usually the projects they're desperate for me to do are, like, action movies. O: They're desperate to have you do an action movie? GVS: Yes, because if they can get me to go along with it, then it's easier for them to get an actor like Brad Pitt to play the lead. It's really up to the actors, not so much the executives. If it were up to the executives, they probably wouldn't have directors at all. O: What were some of the physical challenges of pulling off a shoot like Gerry? GVS: We originally went to Argentina to avoid the Screen Actors Guild strike, which of course never happened. We went down there at a latitude where we expected it to be warm, like San Diego, but we were high enough in the Andes that it was actually really cold. We could have kept shooting in the cold, but we decided to leave for someplace warmer. So my producer and I flew to Jordan to scout Wadi Rum, which is where Lawrence Of Arabia was shot. But there was a travel warning that advised Americans specifically not to go to Jordan, because they had just convicted 14 guys who had blown up the embassy in Africa five years earlier. Even the military was pulling out of Jordan. Because of all that, the crew didn't want to come over. Then we just went to Death Valley, which looked amazing and was close enough to L.A. that we could get equipment very easily. When we got there, it was like 128 degrees, incredible heat. I think the film is helped a lot by the temperature, even though you can't see it. It was so hot that sweat doesn't show on camera, because it evaporates. It was like filming on the inside of a furnace. I think it affected the way I was working, and it affected the way Casey and Matt were walking. It was difficult to physically do things. For example, we had to hike a mile to reach the rock that Casey jumps off of in the film. It was the only time I've experienced anything like true high-seas mutiny feelings from the crew. Erich von Stroheim had shot Greed in Death Valley, and his crew did mutiny when they were shooting on the salt flats. You can easily see with a guy like that and actors like that why people fled. It was very close for us, too. A few did leave, but the crew was really gung-ho, so they took it as a challenge, even though it was super-hard at times not to just pass out. A couple of people got sick, though. Our first casualty was a park ranger who had never really worked in Death Valley before. The rangers wear Kevlar vests, because there are a lot of meth labs in the area, and they worry about getting shot. Death Valley is really wide-open—it's bigger than Rhode Island—and it's less a part of California than an ungoverned territory, so there's lots of weird cops-and-robbers stuff going on. O: One of the reasons you said you wanted to make Gerry was to work with a smaller crew. Why? GVS: I was thinking back to my earlier experience making Mala Noche, when we had four people on the crew and we could do anything. We could go anywhere at any time. We could walk into a restaurant, ask them if we can shoot in the front window for 30 minutes, and get a huge scene in about an hour. It makes things easier, because you're very mobile, and there's not an entire circus going along with you. I try to get that sort of feeling in my films anyway, so the more of that verisimilitude I can put into the image, the better. To have a really big crew always works against that. When I made Drugstore Cowboy, we had like 80 people on the crew, and I could only get about 12 different setups a day, and I wasn't really getting what I would like to have gotten. But then, it depends on what you're doing. When you're making movies on a certain scale, you need a large crew, but when you're making another type, like Gerry, it's very contained: The desert was there, the two guys have the same clothes on all the time, they didn't need make-up… Unless you're doing the Virginia Woolf thing [in The Hours], you don't need make-up, because the camera picks up on it. O: What was your first encounter with Los Angeles in the mid-'70s? You went out there to start a career in Hollywood, is that right? GVS: Yeah. I had graduated from Rhode Island School Of Design in film. I was in Italy with a summer film group at the time, and we visited all the Italian films that were being shot there. It was an incredible time, because all these directors like [Lina] Wertmüller and [Federico] Fellini were working, and [Pier Paolo] Pasolini was making Salo. We were able to go on the set and watch what they were doing. It was like the height of the Italian cinema of that period. Then I went to England to look for work, but it was very difficult, so I thought I should just go to L.A., because coming out of college, I guess I felt an obligation to get a job. [Laughs.] And I did get a job working for [director] Ken Shapiro, who made The Groove Tube, and worked with him for three years as an assistant. After floundering in L.A. for another year after that, I went to New York. O: How did you come to make Mala Noche? GVS: I made a spoof of Hollywood called Alice In Hollywood, which would have been my first feature, but I cut it down because I didn't like it. After doing that film, I felt I was on the wrong track. I did Mala Noche as a way to do something that was outside of the system, because I was outside of the system, and I deliberately chose material that Hollywood wouldn't touch in a million years. During the '70s, I worked as a sound man on a film called Property up here in Portland, and Walt Curtis was a character in that, so I read his book [Mala Noche]. Later, I started writing something that was like Mala Noche, but I figured that instead of me writing it, I should use Walt's book, because it was a solid piece of work, and a good foundation for the film. O: Considering that the financial apparatus for independent cinema as we know it today didn't exist back then, how did you get a movie like that made? GVS: Shapiro had actually spent $100,000 of his own money making The Groove Tube, a project that had originally traveled around to colleges as a video and live performance show. Ultimately, that led to Saturday Night Live, which was born out of The Groove Tube. Lorne Michaels worked for Shapiro, and pitched it to NBC. After he toured the material around to different schools, Shapiro really knew where the jokes were, because he had done so much research in seeing how it played in front of an audience. So I got to watch him make this film and then really flounder in the studio system afterwards. He eventually made Modern Problems and then quit the business altogether. He hated it. Anyway, I was always aware that there was a way to make films independently, because of people like Cassavetes and others who were making it happen. I mean, Pink Flamingos was a $10,000 movie made in '72, when I was still a junior in college. So that demonstrated right there that a guy in Baltimore with little money could make an underground cult hit that could make its money back, and even have a distribution system of sorts. To me, it was a much more exciting prospect than working in Hollywood. And that's sort of what Shapiro did on a different level. The Groove Tube was very successful for him. It made him enough money to live in Hollywood, and it was done entirely outside the system. Maybe people weren't doing it then on the scale that they're doing it now, but it was possible. O: Was Mala Noche self-financed? GVS: Yeah. I just saved up money working in advertising in New York and moved out to Portland to make it. O: The film did get a certain amount of attention, but there was a gap between it and Drugstore Cowboy. Was it difficult to get Drugstore off the ground? GVS: I went to Berlin and tried to sell Mala Noche at the festival. It was the same year as My Beautiful Laundrette, but it wasn't a very polished movie, and distributors didn't desire it like they did My Beautiful Laundrette. Some of the distributors that might have bought Mala Noche bought that one instead. So I didn't have any luck there, but eventually, I went to the L.A. Lesbian And Gay Film Festival, and that's really what got my career going, because the film opened the festival, and the L.A. critics came to that showing. That year, the Los Angeles Film Critics Circle gave me a sidebar award for Best Experimental Independent Movie, and that got Drugstore Cowboy going. Even though I had been shopping the script around for a while to potential financiers, the award validated their decision to make it. O: You made films before major studios started their own "boutique" labels for independent films. How do you think that has affected independent films in general? GVS: The commercialization of it changed things, but some of these companies existed before [the boutiques], like Cinecom, New Line, and Avenue Pictures, which did Drugstore Cowboy. They had a lot of energy, and it was a good time, but it ultimately comes down to box-office, and that influenced the decisions they made. And it's still like that. I don't feel like things are all that different today. The independent projects that existed back then were also always geared toward box-office, like El Topo or The Rocky Horror Picture Show, movies that attracted attention. O: When you accept a mainstream project, how do you reconcile your interests with the bottom-line thinking of the studios? GVS: Even Drugstore Cowboy was a studio situation, because there was the same sort of give-and-take with the executive office. For example, they wanted to cut William S. Burroughs out of the movie entirely, and we had to fight for him. That's probably the biggest fight I've ever had, so smaller companies can be just as fierce as their studio counterparts. I think it can happen on a completely independent film, as well. There's a guy funding a film by a friend of mine, and he's decided that he holds all the cards, since he put up the million-and-a-half budget, so he wants to re-cut the movie. Legally, my friend can't do anything about it. That's worse than at a studio like Sony, because there, you can rally political support around you and get over points of contention. O: How do you feel about submitting to processes like test screenings or focus groups? GVS: Each film has a story. I don't think of To Die For as a cutting-edge film, but it was a dark comedy that didn't fall into any obvious category, and the testing was really off. They weren't trying to test it among people who would go to see a film like that. They were testing it as a romantic comedy. It really ruined the test, because viewers went into the screening expecting to see something like Sleepless In Seattle, and, when polled, they would come away giving us a really bad mark. Whereas with Good Will Hunting, Miramax made certain the recruited audience wasn't expecting to laugh at Robin Williams like they normally do. From my limited experience, you can really blow test screenings by conducting them in the wrong way. Perhaps they were trying some other experiment with To Die For that we didn't know about, but we were shielded from the entire process. There was an instance when my editor actually infiltrated the indoctrination of these people invited to the screening, and he got a lot of information from the people giving out the tickets. All they knew was that To Die For was a romantic comedy starring Nicole Kidman, and they didn't know anything else about it. So when we presented that information to the president of Sony, she just said, "Don't talk about that part of the test," and she wouldn't allow us to speak about that side. It was really wrong, what they were doing. In the end, the press kind of saved it, because Sony thought the film was disastrous, but it got a very good reception at Cannes. O: After the test screenings, did the studio come back to you and force you to change things? GVS: Yeah, we edited it for about a year. They kept saying, "Just make it better." They didn't ask us to change it into a romantic comedy, but we wound up changing it quite a bit. Eventually, we changed the way the whole film was put together, because we ran out of other things to do. We changed the order of Buck Henry's script. O: That's strange, because you move pretty freely through time in that film. Aren't studios usually concerned that audiences won't be able to follow a non-linear story? O: Did you try strategies like making it seem like you'd changed things more than you did, in order to smuggle your version past the studio? O: Why do you think the nature of your Psycho remake upset people in ways that other remakes do not? GVS: I don't know. That's a good question. One reason, I suppose, is that we said we were going to remake it and copy the shots. That was really the only difference between Psycho and other remakes. And also because it's Psycho, which has really become a brand name. The first person I told about the film was Danny Elfman, who I thought would be perfect to do the score. After hearing the idea, his first reaction was, "The critics will kill you. They will absolutely kill you." I said, "Yeah, but is that a reason to do or not to do a film?" It was almost scary the way he prophesied it, and he was right. They did kill me. [Laughs.] I guess I asked for it. O: But the film wasn't strictly shot-for-shot. GVS: No. We tried, but we realized early on that the film was begging to have its own rhythm. If we stuck literally to every frame number, it wasn't as loose as it could be. That was something we found out: It was hard to copy something literally, which was the experiment. O: Where did you find the film deviated most from Hitchcock's? GVS: Everything changed, because Hitchcock had an inimitable way of filmmaking. The way he relates to his characters, and just the way he learned to make movies in the first place, is very different than anything I've done. So the gestalt of my project was so different that we wound up with a very strange-looking copy. O: Did the film ultimately work for you? O: Is it true that you've thought of remaking it again? GVS: Yeah, I've mentioned that it would be interesting to remake it in a completely different style, like a punk-rock version of Psycho. When we were shooting it, Viggo Mortensen and I were talking about the next one. We were going to do a black Psycho, a punk-rock Psycho… Viggo knows all the punk rockers, so he had some ideas about how to pull it off.